Will Motorola go ahead with its Google TV rival? 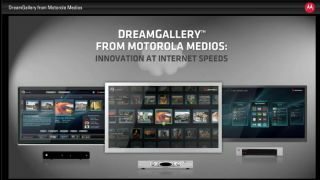 Motorola has shown off DreamGallery, a concept user interface for web-enabled TVs. Using DreamGallery, your TV becomes a cross-platform media centre, connecting computers, tablets, and smartphones. It also brings together all the TV shows and films offered by on-demand services like Netflix, Lovefilm, and BBC iPlayer into one place, simplifying matters considerably. In other words, it's a lot like Google TV. The only thing is, Google is in the process of taking over Motorola Mobility, with the final touches said to be being made to the deal right now, with completion expected in the next day or so. So how is Google going to take to Motorola launching a direct rival to its own TV service? Motorola describes the DreamGallery as giving consumers "their media, on their terms." The graphics-heavy user interface isn't a million miles away from the redesigned Apple TV that launched alongside the new iPad back in February, but with a shiny overlay that looks a bit like Windows 7. Will it see the light of day? Also promised: intuitive graphics to help you find what you want quickly, personalised recommendations, and "unique tools" to help ISPs keep the speeds up and deliver a seamless experience. Google is acquiring Motorola to raid its vast back catalogue of patents, and help swell its Android offerings to mount a greater challenge against Apple. The deal was rubber stamped by the Chinese authorities over the weekend, leaving Google all clear to go in and take the keys. So we'll have to wait and see whether Motorola's DreamGallery ever sees the light the day.